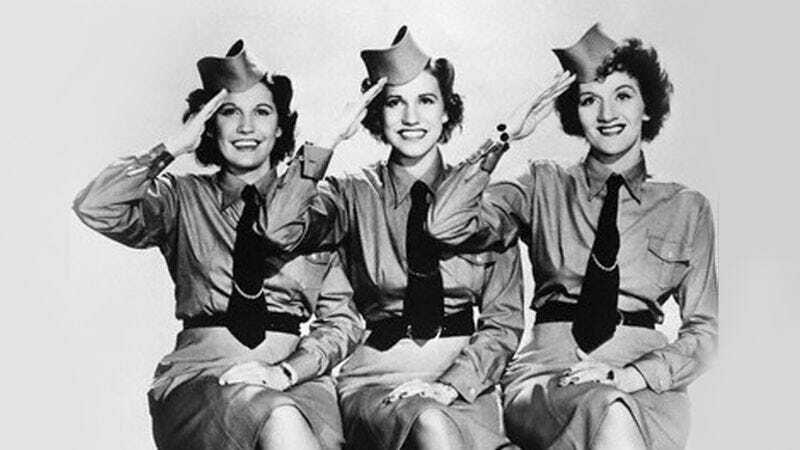 Patty Andrews, the last remaining member of The Andrews Sisters, has died. She was 94. During World War II, the sisters went from base to base in America, Africa, and Italy and sung for countless members of all four armed services. Along with Bette Davis and John Garfield, they founded the famous Hollywood Canteen, where they would often perform for servicemen. They released a series of records, dubbed Victory Discs, that were distributed to members of the Allied fighting forces, and did appearance after appearance on different Armed Forces Radio shows. The trio was also active in the campaign to get people to purchase war bonds, including covering Irving Berlin’s “Any Bonds Today?” to help drum up money for the cause. During the war, Andrews Sisters records were smuggled into Germany after being relabeled “Hitler’s Marching Songs.” Tracks like “Bei Mir Bist Du Schon” even became popular with the Nazis, until they found out the song’s authors, Sammy Cahn and Saul Chaplin, were Jewish. In 1951, with her husband acting as her agent, Patty left the group. Her departure caused understandable strife within the sisters, and Maxene and LaVerne didn’t talk to Patty for two years. But the trio reunited in 1956, and after signing with Dot Records in 1962, it released a number of stereo albums that featured covers of songs like “I Left My Heart In San Francisco” and “Puff The Magic Dragon.” They also toured extensively at that time, playing frequently in Las Vegas. During their careers, the sisters appeared in 17 films, including several Abbott And Costello movies and Road To Rio with Bing Crosby and Bob Hope. They also wrote and sang jingles for everyone from Wrigley’s to Nash Motors and Kevinator home appliances. In all, the sisters recorded 47 duets with Crosby, including hits like “Pistol Packin’ Mama,” “Don’t Fence Me In,” and “Jingle Bells.” They also had 113 songs make the Billboard charts, including 46 that landed in the Top 10—more than either Elvis Presley or The Beatles ever had.